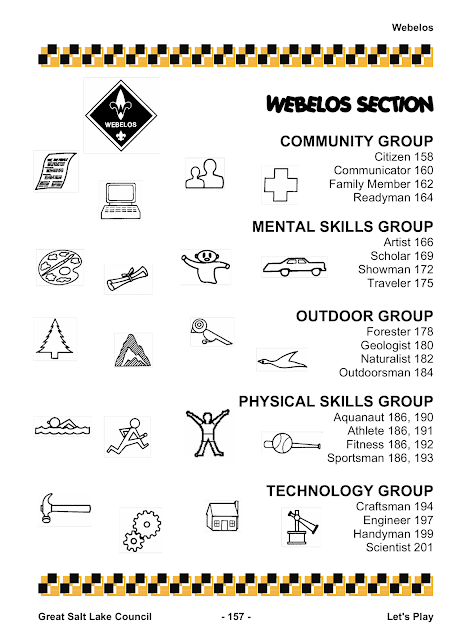 Webelos Section was an additional section added to the 2006-07 Great Salt Lake Utah Council PowWow book. This is a great section, and many of the ideas that were used back then can still be used today. Hurry Cases - Teach the three important steps when responding to an emergency or accident. Practice Escape Plans Every Month! What is the Height of a Tree? Native American Indian Nations was the official Cub Scout theme in November 2007. The following information is from the 2006-07 Great Salt Lake Utah Council PowWow book. This is a great theme, and many of the ideas that were used back then can still be used today. 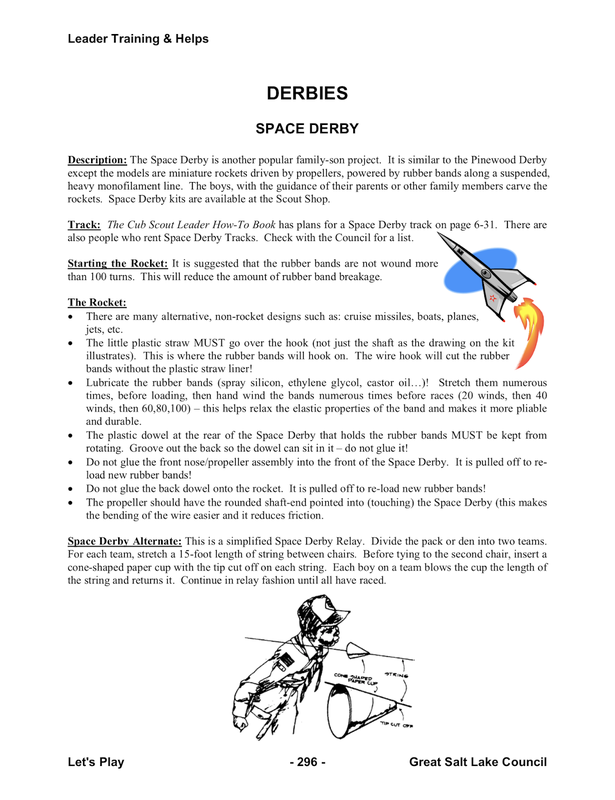 This information for holding a Space Derby was in the 2006 Utah Great Salt Lake Council PowWow book. This is a great idea, and many of the things that were used back then can still be used today. 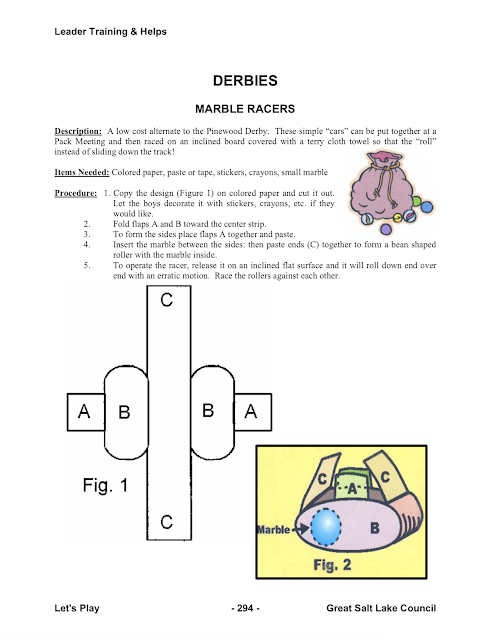 Description: The Space Derby is another popular family-son project. It is similar to the Pinewood Derby except the models are miniature rockets driven by propellers, powered by rubber bands along a suspended, heavy monofilament line. 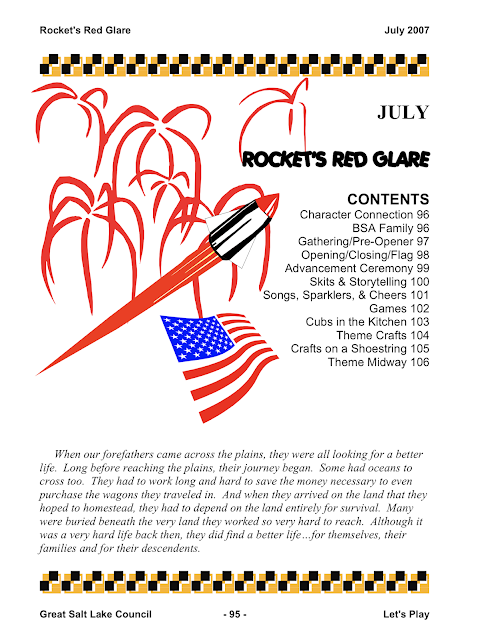 The boys, with the guidance of their parents or other family members carve the rockets. 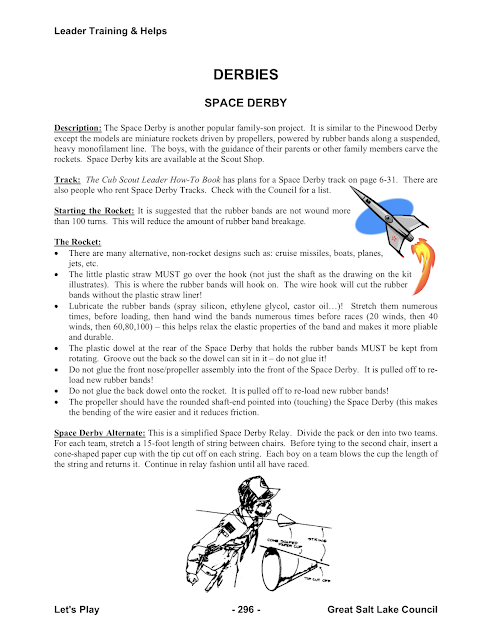 Space Derby kits are available at the Scout Shop. Track: The Cub Scout Leader How-To Book has plans for a Space Derby track on page 6-31. There are also people who rent Space Derby Tracks. Check with the Council for a list. Starting the Rocket: It is suggested that the rubber bands are not wound more than 100 turns. This will reduce the amount of rubber band breakage. There are many alternative, non-rocket designs such as: cruise missiles, boats, planes, jets, etc. The little plastic straw MUST go over the hook (not just the shaft as the drawing on the kit illustrates). This is where the rubber bands will hook on. The wire hook will cut the rubber bands without the plastic straw liner! Lubricate the rubber bands (spray silicon, ethylene glycol, castor oil...)! Stretch them numerous times, before loading, then hand wind the bands numerous times before races (20 winds, then 40 winds, then 60,80,100) – this helps relax the elastic properties of the band and makes it more pliable and durable. The plastic dowel at the rear of the Space Derby that holds the rubber bands MUST be kept from rotating. Groove out the back so the dowel can sit in it – do not glue it! Do not glue the front nose/propeller assembly into the front of the Space Derby. It is pulled off to re- load new rubber bands! Do not glue the back dowel onto the rocket. It is pulled off to re-load new rubber bands! the bending of the wire easier and it reduces friction. Space Derby Alternate: This is a simplified Space Derby Relay. Divide the pack or den into two teams. For each team, stretch a 15-foot length of string between chairs. Before tying to the second chair, insert a cone-shaped paper cup with the tip cut off on each string. Each boy on a team blows the cup the length of the string and returns it. Continue in relay fashion until all have raced. Other Resources was an additional section added to the 2006-07 Great Salt Lake Utah Council PowWow book. This is a great section, and many of the ideas that were used back then can still be used today. 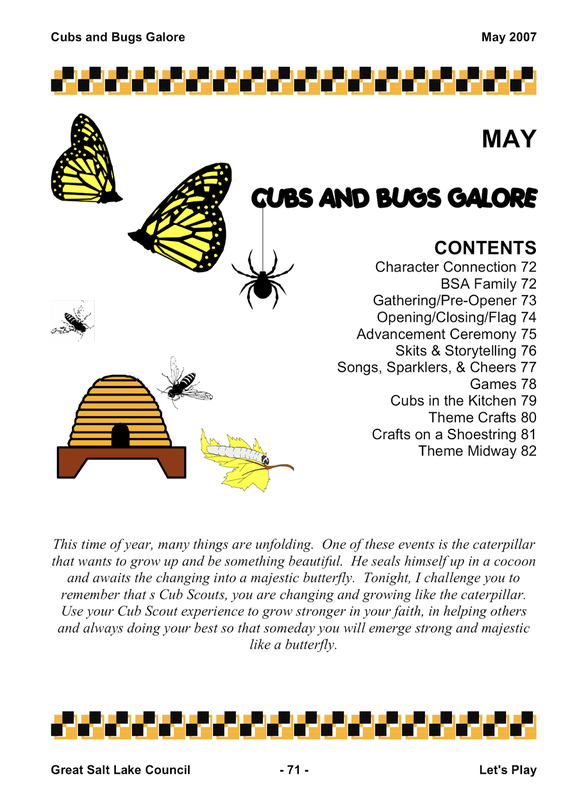 Cubs and Bugs Galore was the official Cub Scout theme in May 2007. The following information is from the 2006-07 Great Salt Lake Utah Council PowWow book. This is a great theme, and many of the ideas that were used back then can still be used today. Printable - Unscramble the insect names, then put the letter of the description in the box. 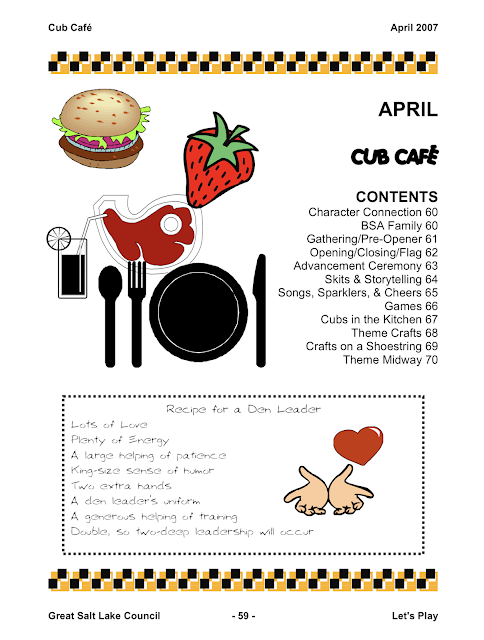 Cub Cafe' was the official Cub Scout theme in April 2007. The following information is from the 2006-07 Great Salt Lake Utah Council PowWow book. This is a great theme, and many of the ideas that were used back then can still be used today. What kind of cheese do dogs like on pizza? Why didn't the banana snore? Why is the river the richest thing in the forest? It's Time to Set the Table! This information for holding a Raingutter Regatta was in the 2006 Utah Great Salt Lake Council PowWow book. This is a great idea, and many of the things that were used back then can still be used today. Description: The Raingutter Regatta is a race in which boats race along a narrow channel (10-foot lengths of raingutter). The wind powered version uses sailboat designs and the boats are blown down the channel. Each boy builds his own boat with the supervision of a parent of other family member. He also supplies the wind for the sail with his own lung power. Raingutter Regatta kits are available at the Scout Shop. For a different idea, you can use vegetables carved as boats. Race Day: The race involves two lanes of raingutter. The boys are to blow air on the boats in order to advance them through the water. 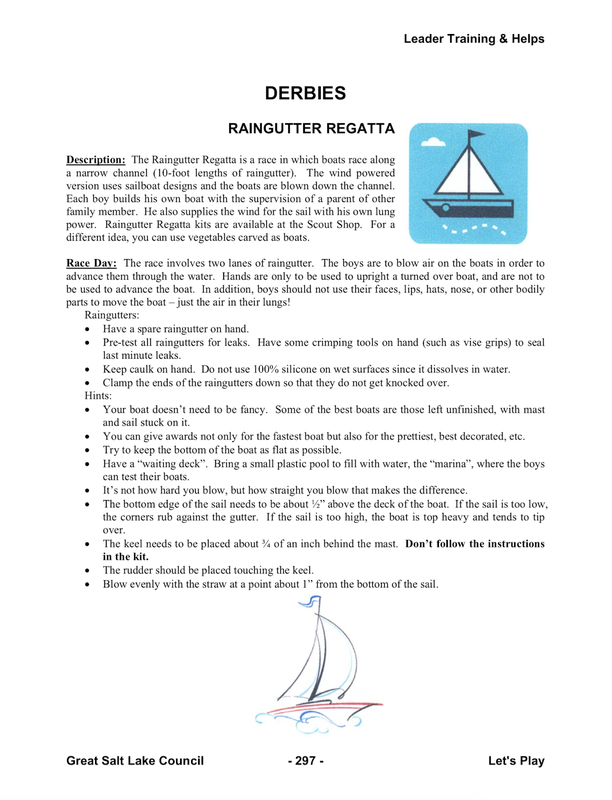 Hands are only to be used to upright a turned over boat, and are not to be used to advance the boat. In addition, boys should not use their faces, lips, hats, nose, or other bodily parts to move the boat – just the air in their lungs! Have a spare raingutter on hand. Keep caulk on hand. Do not use 100% silicone on wet surfaces since it dissolves in water. and sail stuck on it. You can give awards not only for the fastest boat but also for the prettiest, best decorated, etc. Try to keep the bottom of the boat as flat as possible. It’s not how hard you blow, but how straight you blow that makes the difference. The rudder should be placed touching the keel. Blow evenly with the straw at a point about 1” from the bottom of the sail. Rocket's Red Glare was the official Cub Scout theme in July 2007. The following information is from the 2006-07 Great Salt Lake Utah Council PowWow book. This is a great theme, and many of the ideas that were used back then can still be used today. 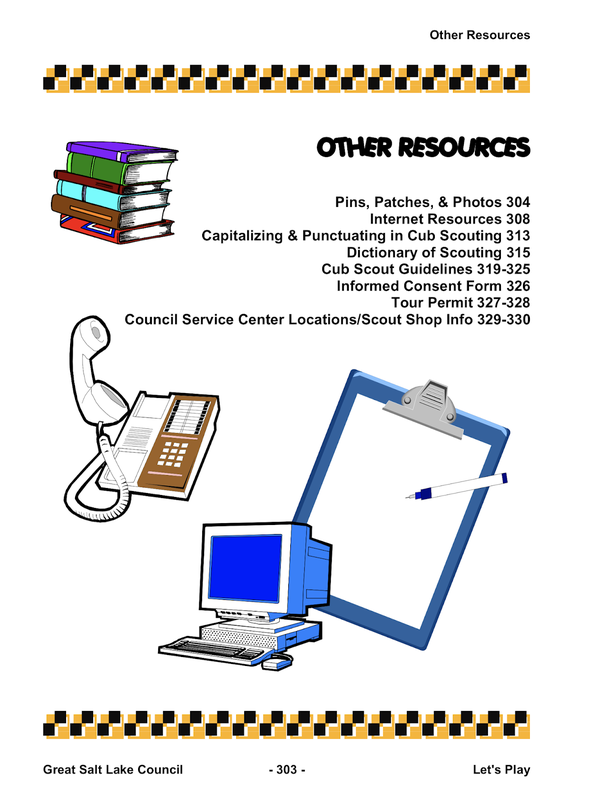 Printable Matching Game - Who did these Eagle Scouts become? This information for holding a Marble Racer Derby was in the 2006 Utah Great Salt Lake Council PowWow book. This is a great idea, and many of the things that were used back then can still be used today. Description: A low cost alternate to the Pinewood Derby. These simple “cars” can be put together at a Pack Meeting and then raced on an inclined board covered with a terry cloth towel so that the “roll” instead of sliding down the track! Copy the design (Figure 1) on colored paper and cut it out. Let the boys decorate it with stickers, crayons, etc. if they would like. Fold flaps A and B toward the center strip. To form the sides place flaps A together and paste. Insert the marble between the sides: then paste ends (C) together to form a bean shaped roller with the marble inside. To operate the racer, release it on an inclined flat surface and it will roll down end over end with an erratic motion. Race the rollers against each other. Aloha Cub Scouts was the official Cub Scout theme in February 2007. The following information is from the 2006-07 Great Salt Lake Utah Council PowWow book. This is a great theme, and many of the ideas that were used back then can still be used today. 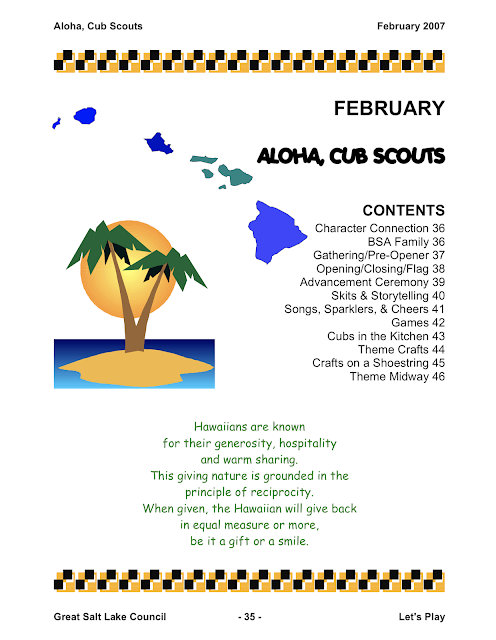 Printable on Hawaii & write the names of the cities on the correct island. 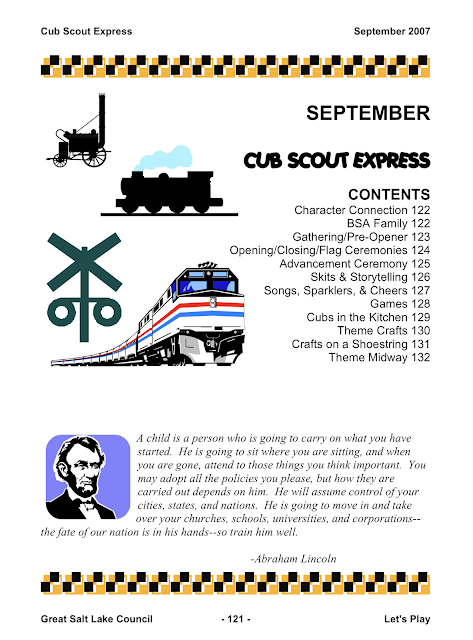 Cub Scout Express was the official Cub Scout theme in September 2007. 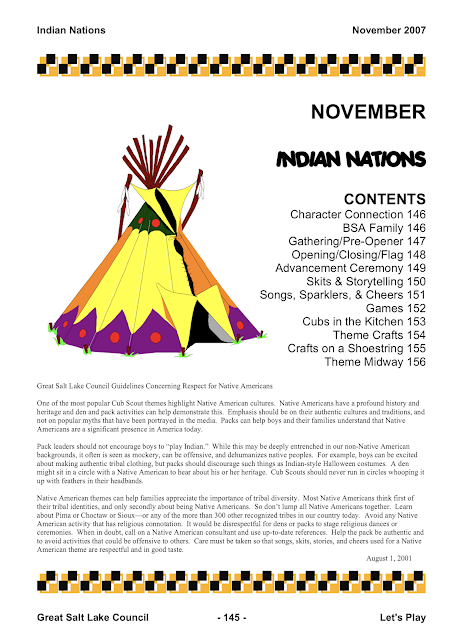 The following information is from the 2006-07 Great Salt Lake Utah Council PowWow book. This is a great theme, and many of the ideas that were used back then can still be used today. Railroad Sights to See that are "Close to Home"
Joke - What kind of train gives people colds?